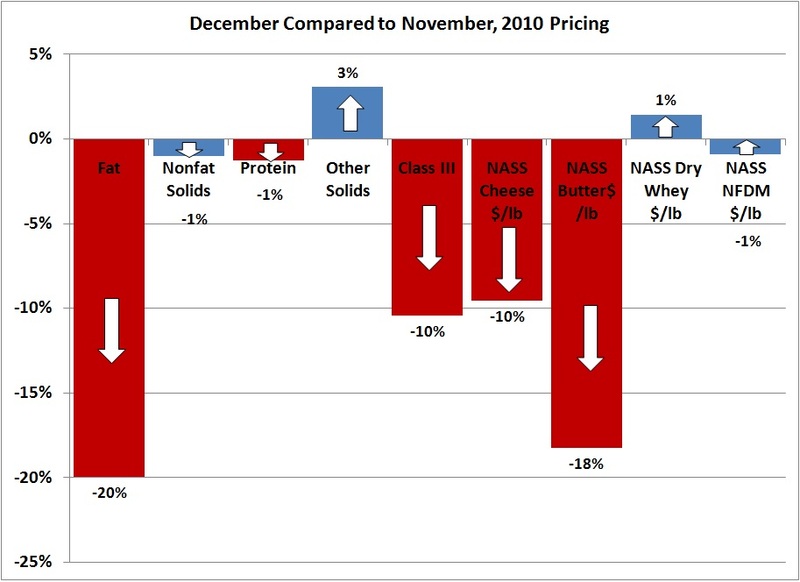 December 2010 Class III milk and component prices were released December 30, 2010. 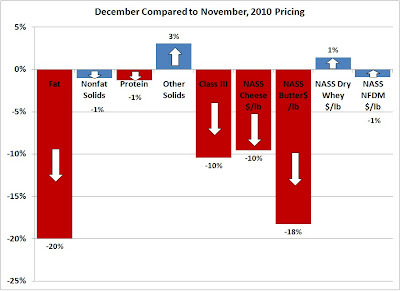 The changes were drastic with Class III milk falling to $13.83/cwt from November's $15.44 and October's $16.94 . 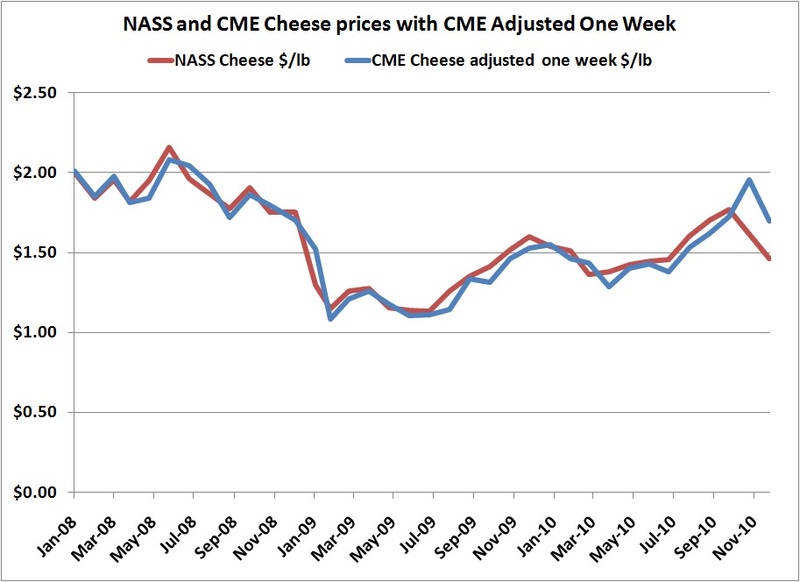 The Class III price is driven by the NASS price for cheese which has fallen significantly in the last two months. 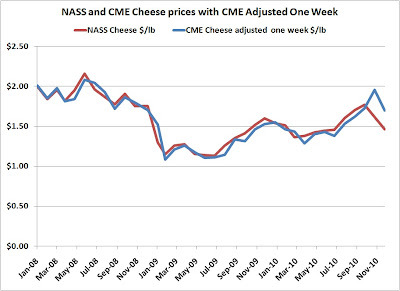 The drop in cheese prices is not a surprise. Inventory levels of cheese have been very high for nearly a year, and cheese prices cannot hold gains when inventories are high. 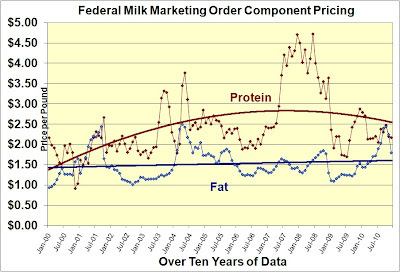 This can be illustrated in two different graphs, both based on USDA numbers. 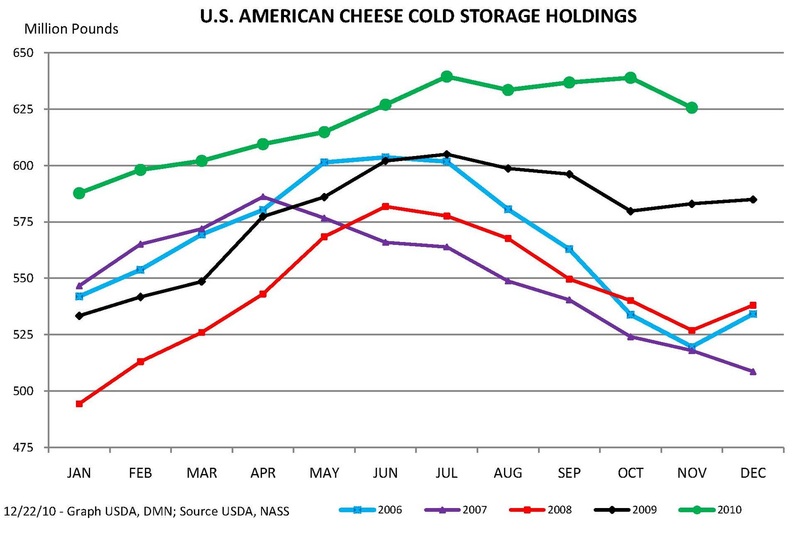 The first graph shows the U.S. American Cheese inventories on an annual basis. These cheese levels started growing in mid 2009 and have remained well above prior year levels. 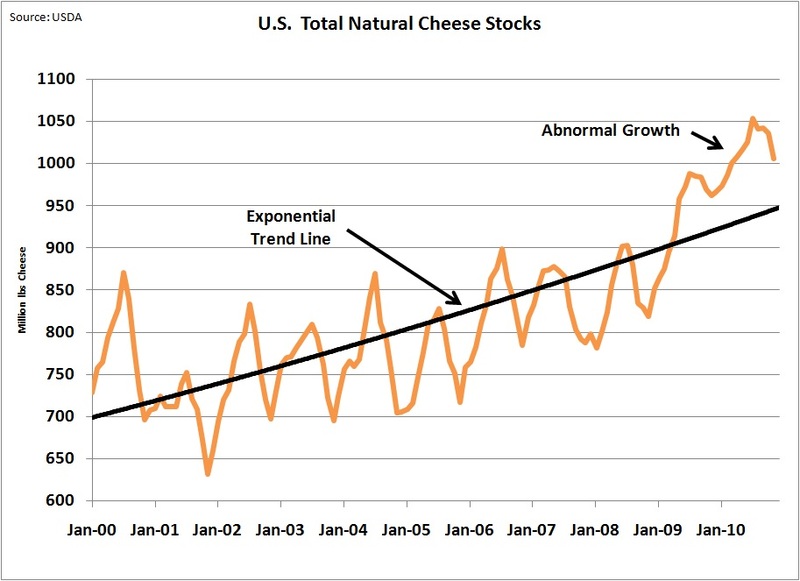 The above chart is dismissed by some who say this is strictly the impact of increased cheese consumption. 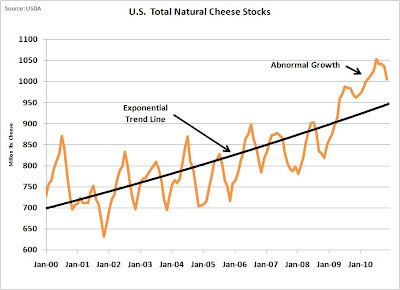 However, when total cheese inventories are compared to the normal growth trend line, it is clear that cheese inventories are well above the normal growth expectation. 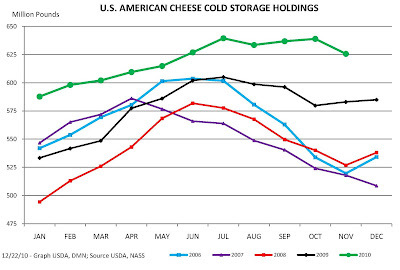 Until these inventories come back in line with historical levels, higher cheese prices cannot be sustained. However, the amount of the decline in NASS cheese prices, 10%, was surprising. The CME and NASS prices are typically very closely correlated, but in the last two month, the NASS prices have been well below the CME prices. Comparing the the differences between the CME and NASS (graph below), the current difference is a very significant change. Typically one can predict the NASS one week in advance by following the CME prices, however, the last two weeks of activity have put this methodology is question. The CME is based on a very small slice of the buying and selling activity. 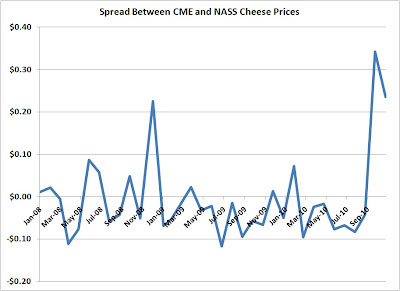 If the large NASS and CME differences continue, it will change the nature of the cheese pricing. The big mystery for the month is butter pricing. 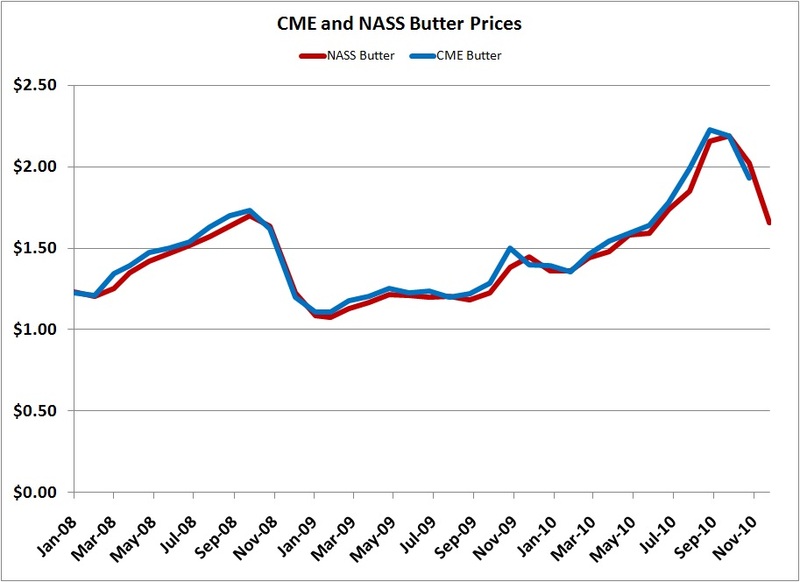 Butter has fallen in price on both the CME and the NASS. 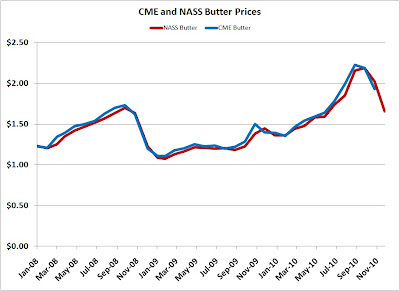 CME figures for December butter will be available soon, but there has been no issue with correlation between the NASS and CME figures on butter, so it will probably be in line. 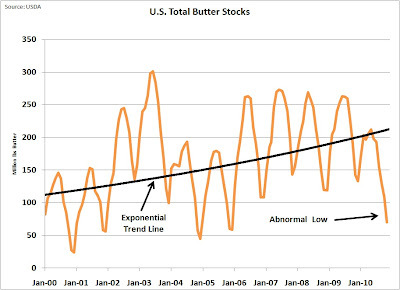 What is irrational is the drop in butter prices with an accompanying significant drop in inventories. 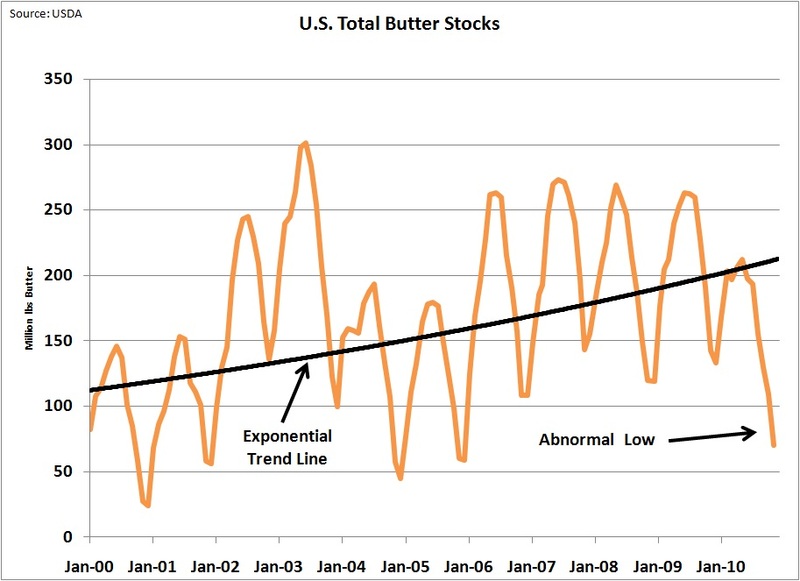 Butter inventories hit a low of 70 million pounds in November. December numbers should be available soon. With inventories very low, a significant drop in prices was unexpected and appears irrational. 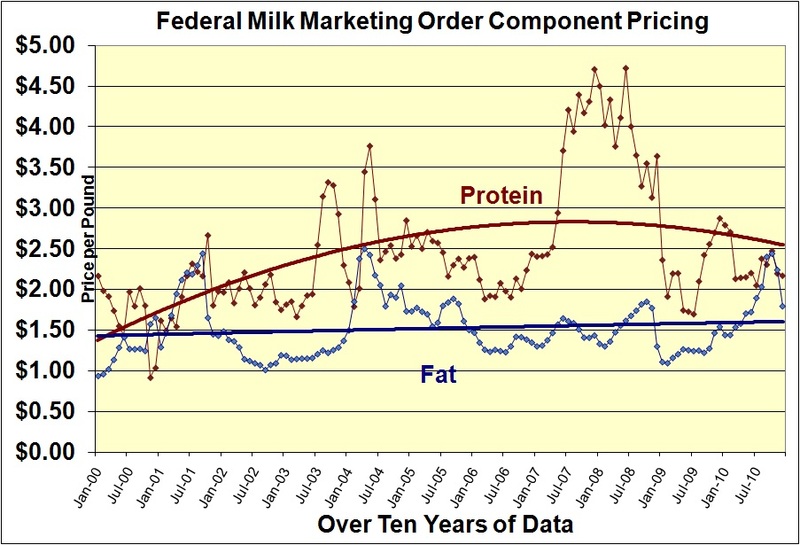 The relationship between milk protein and milk butterfat returned to a more normal relationship with protein well above the value of butterfat. The year of 2010 has been another year of change and there is no reason to expect 2011 will be any different. In a subsequent post to this blog, the year of 2010 will be examined to see what can be understood that can possibly provide any indication of where 2011 may be going.